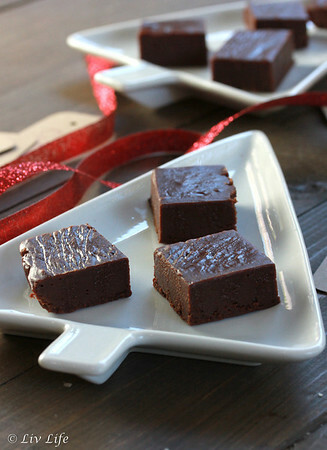 Fudge... another holiday classic. Luscious, rich, and melt in your mouth fabulous, can you imagine receiving a plate and not being able to eat it? Such is the case with my teenage son. 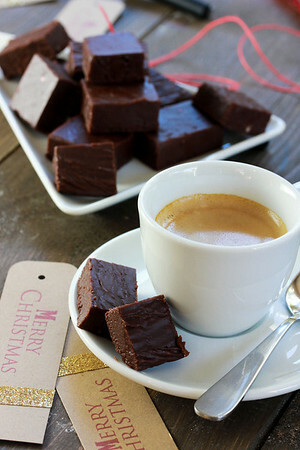 Years ago lactose intolerance hit with a vengeance and a decadent taste of dairy-filled fudge was no longer an option. He rarely complains, and accepts his dairy-free life with a positive attitude, but the holidays are often difficult as treats that used to be favorites arrive on festive plates he can't touch. This year after we received a gift plate overflowing with the chocolate confection, he dejectedly turned and walked away. Knowing how much he wanted a piece I did a bit of research and put together a version that soon had him swooning. 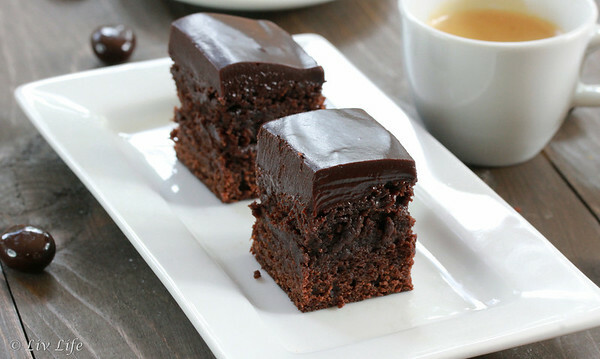 Using alternative butter and almond milk combined with cocoa powder, this version brings that same luscious mouth-feel and a rich chocolate flavor that melts nicely on the tongue and has you reaching for seconds when no one is looking. The smile spreading across his face followed by a rare hug and a simple "I love you, Mom. ", had my already full heart growing three sizes in just that moment. From all of us here at Liv Life, we wish you a Merry Christmas and a New Year filled with health, adventure and food that makes you swoon. Welcome to Day #6 of Christmas Week, a multi-blogger event co-hosted by Kim of Cravings of a Lunatic and Jen from Juanita’s Cocina! Each day we will be celebrating the holidays with a different set of Christmas-themed treats, as well as a fabulous Christmas giveaway. We hope you enjoy this fabulous event. Tune in each day starting today, Monday, December 9th and ending Saturday, December 14th. A few weeks ago I posted about my holiday spirit... or as you may remember, it was my lack of holiday spirit that concerned Liv and had her proclaiming how much more joyful other moms made the season. Well, this year I've been working on it, and I'm succeeding! Christmas Spirit just may be a state of mind, but embracing this season has had my December a really joyful place. From decorating and shopping to wrapping presents and writing cards, this season has been amazingly fun and I owe a part of my joyousness to Kim and Jen for setting up #ChristmasWeek and including me in the festivities. Reading the cheerful and jolly posts from this fabulous group of food bloggers, one's heart can't help but soar. And today, we wrap up this celebration with even more treats and one final giveaway... the best of the week according to Liv. Everyone knows Buddy from the Cake Boss right? Check below for this awesome Cake Boss bakeware and tools giveaway! But first we have a treat. 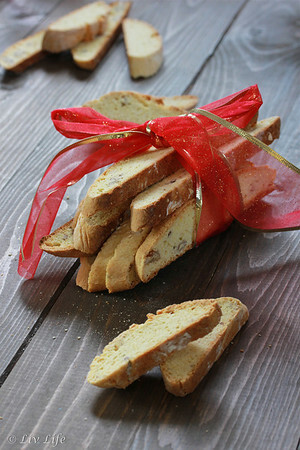 The amazingly bright Triple Orange Biscotti. If you're a regular reader of Liv Life, you can probably guess my favorite ingredient of the orange trio... that heavenly and luscious Grand Marnier. 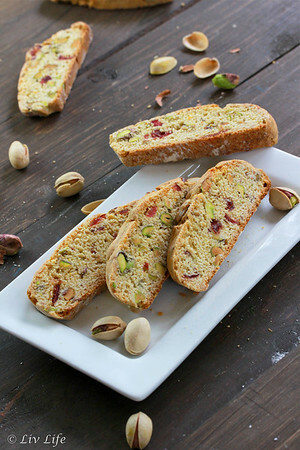 While the recipe includes only a few tablespoons of the ambrosial liquor, I've found the ingredient truly takes the biscotti up a level. Along with fragrant orange zest in combination with the juice of a seasonal sweet orange, these crunchy treats bring a brightness to your morning coffee and a perk to an afternoon treat. Packaged in a cute tin or a clear bag with a bow, these cookies make an ideal hostess gift, and with the decent sized result from the recipe, there are always plenty to save a few for yourself. 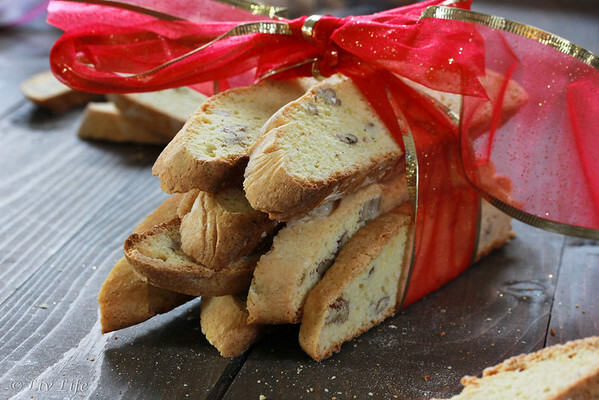 I've been making biscotti for some 20 years, and while I love everything about these cookies, I have to admit their sticky dough is one of the most challenging I've worked with. A Fine Cooking recipe from 2003, I've made this recipe several times as written as well as with a few variations, all with success. With olive oil included in the ingredient list, I've occasionally left the oil out to reduce the calorie count, and I've also substituted whole wheat flour for a portion of the all-purpose. 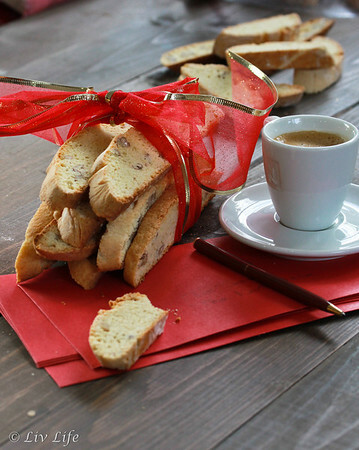 But for the holidays I usually stick to the original recipe and these sunny biscotti are always welcomed with a smile. The recipe comments that the dough will be sticky... and be aware that they really mean it. Sticky... very, very sticky. Making my biscotti yesterday I decided to try two batches, one exactly as written in 2003 and the second, making changes where I figured I could probably make the biscotti better. How did they turn out?? Well... lets just say both versions were exceedingly good, and while my version was innately easier to work with, the Fine Cooking version baked up better. Hence, I'm sticking with the sticky dough (it almost seems slack, as if it will puddle off of the cookie sheet, but it won't) and admitting that Fine Cooking really might know as much as, or perhaps... a little more than I about baking. But who knows more about baking than anyone?? The Cake Boss!! And wouldn't you love to be the lucky recipient of this fabulous giveaway??? Liv looked at it this morning and exclaimed, "Why, oh why did you have to write for this one? What were you thinking??" I believe I got one of my first serious eye rolls included somewhere in there too. But she's kind of right, how cool is this???!!! And now that you've entered to win that awesome prize package, take a trip with me to see what everyone else brought to close out this fabulous #ChristmasWeek! Welcome to Day #4 of Christmas Week, a multi-blogger event co-hosted by Kim of Cravings of a Lunatic and Jen from Juanita's Cocina! Each day we will be celebrating the holidays with a different set of Christmas-themed treats, as well as a fabulous Christmas giveaway. We hope you enjoy this fabulous event. Tune in each day starting today, Monday, December 9th and ending Saturday, December 14th. Ahhh... cinnamon! Wafting through your kitchen it seems to be the aroma of the holidays. 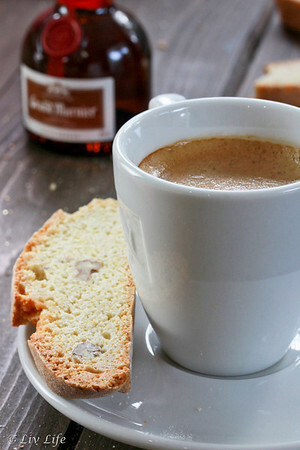 From cookies to cider to steaming French Toast, cinnamon is nearly universally welcomed. We love our cinnamon treats, but with the cookie and treat overload these past few weeks, I've tried to incorporate holidayish flavors into a hearty and healthy bread. 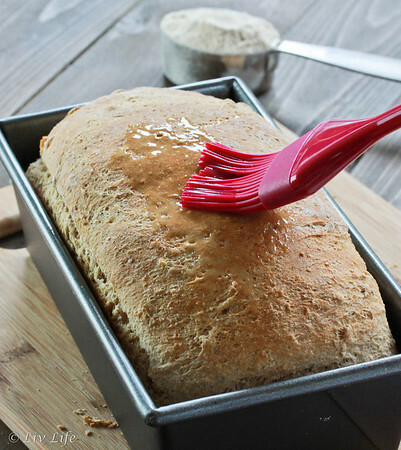 Personally, I find making homemade bread incredibly fulfilling. Knowing exactly what ingredients are in my loaf allows me to tweak the bread as I see fit for that day. Need something more healthy? We can always add more grains. Need a bit of a treat? A nice white loaf usually does the trick. But want something in between? 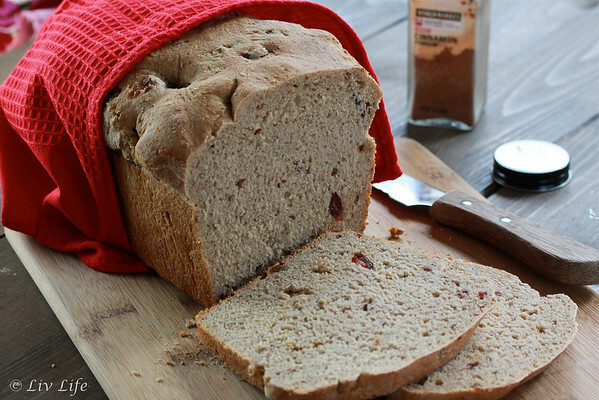 We've got the answer right here in this soft, tender Cinnamon Raisin Oatmeal Bread. 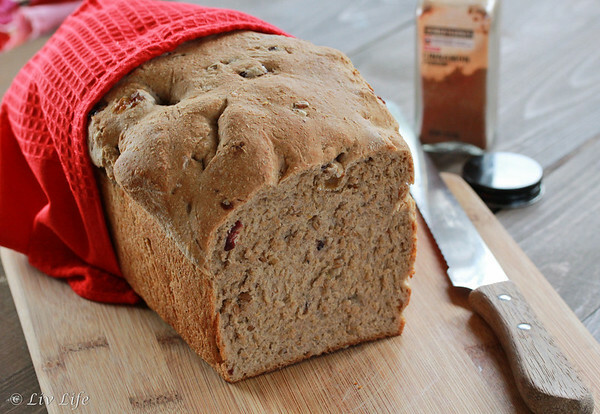 Hearty with whole oats, yet sweet with cinnamon and either raisins or cranberries, this bread makes fabulous toast and a mean PBJ. French Toast becomes extra special with a double dose of cinnamon and a drizzle of pure maple syrup, and with each serving the bread brings servings of heart healthy fiber and whole grains. 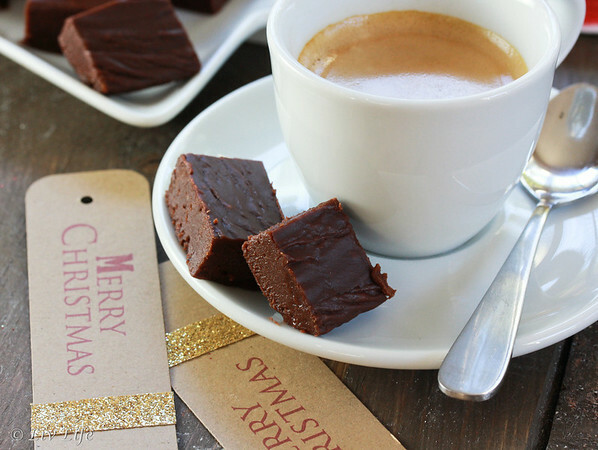 So why not join me in a slice and a cup of tea as we visit the rest of today's #ChristmasWeek participants? I'm certain they have treats to make us swoon! 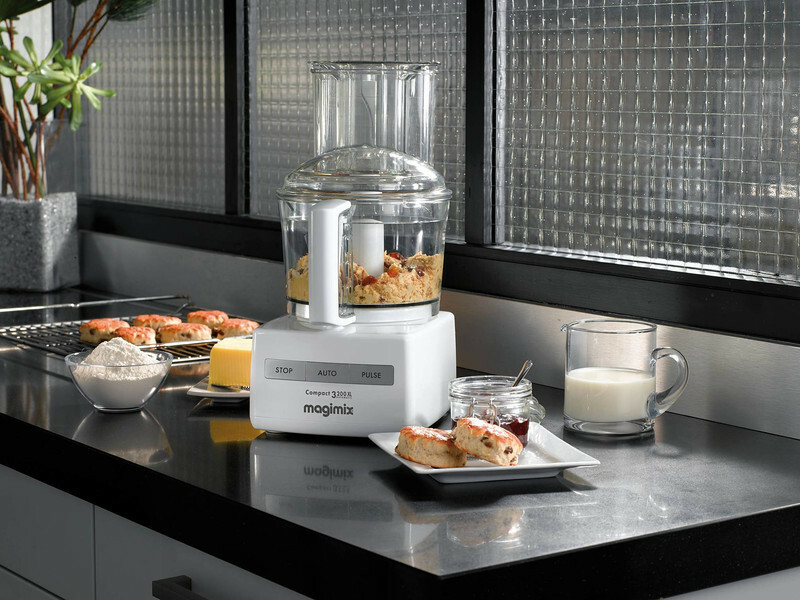 And that brings us to today's giveaway courtesy of Swissmar. Le Cordon Bleu has been a worldwide leader in gastronomy and hospitality for over 100 years and is widely considered the guardian of French culinary technique. Swissmar now combines this culinary expertise with their own knowledge and brand recognition to introduce this fantastic new line. 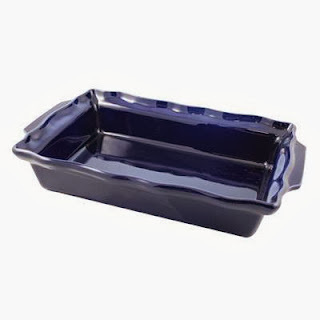 The Le Cordon Bleu ceramic ovenware from Swissmar is all freezer safe, oven safe, dishwasher and microwave safe. The French-inspired Charmant Collection 5 qt. Rectangular Roaster has scalloped edges and is beautiful enough to go straight from oven to table. Want one for yourself?? Enter to win a Swissmar Roaster with the Rafflecopter below! Welcome to Christmas Week, a multi-blogger event co-hosted by Kim of Cravings of a Lunatic and Jen from Juanita's Cocina! Each day we will be celebrating the holidays with a different set of Christmas-themed treats, as well as a fabulous Christmas giveaway. We hope you enjoy this celebratory event and that you will tune in each day starting today, Monday, December 9th and ending Saturday, December 14th. Usually I'm behind the power curve when it comes to getting involved in blogging events, but this week I'm actually involved! Celebrating all things Christmas with a multitude of blogger friends, we're bringing you treats for the holiday as well as a giveaway every day. Liv Life will be participating today, Wednesday, Thursday and Saturday, but don't forget to keep an eye out for posts on Tuesday and Friday as there's a new giveaway in combination with delectable treats each and every day! Today we're bringing one of our favorite Christmas Treats. (Well... 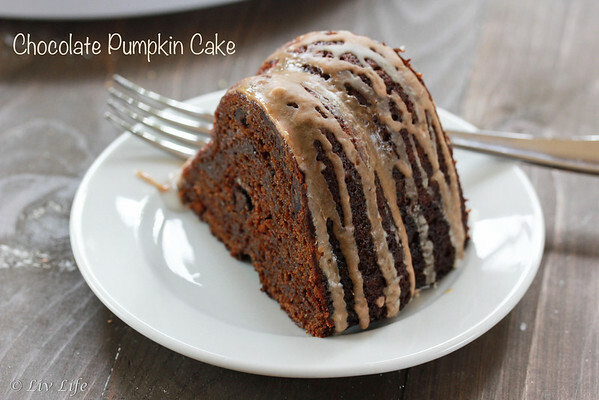 I know I'm supposed to post Christmas treats, but I have to admit that this Chocolate Pumpkin Cake is something that I stock up on seasonal pumpkin for as we've been known to bring it to summer bbq's as well). But for today, it's for Christmas, and a wonderful addition to any Christmas Party it is. 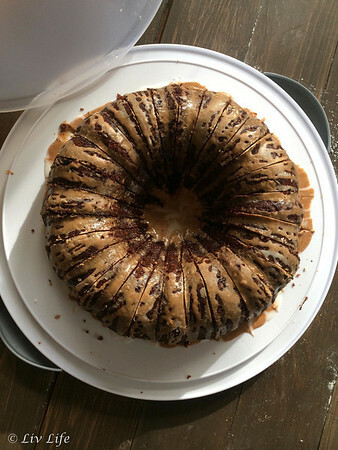 With the indulgence of the season, this cake with it's lower fat content and a touch of whole grains is one I love to make for the holiday season. Adding pumpkin puree kicks up the nutrition content even more, and while I don't think we can really call it "health food", it's definitely not as indulgent as some of the other treats we've been sampling these last few weeks. 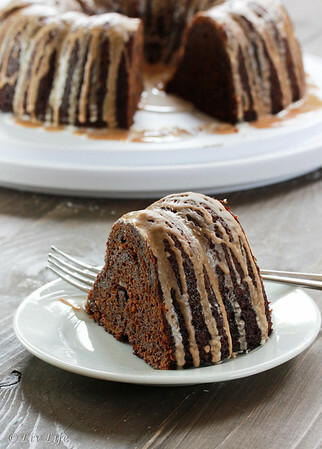 Chocolaty and doused in not just one, but two spiced glazes, this moist cake goes a long way to serve a crowd. Sliced into thin slices, we've been known to get nearly 20 pieces out of one cake, and it's so popular, often there are no leftovers for me to bring home. Decadent chocolate enhanced with seasonal spices... this one has earned its place on the top of our favorite list. And now that we've had a treat... how about that giveaway I mentioned?? I'm so happy to be participating in #ChristmasWeek this year, and thrilled to be writing alongside some fabulous food bloggers. Give them a visit and see what they brought to the table! Peanut buttery with a delightful sugar crunch and kissed with a touch of chocolate, most everyone loves these classic cookies. For many of us, the Peanut Blossom transports us back to our childhood, while faces of kids today shine with recognition as they eagerly reach for seconds. I'm guessing Mrs. Freda Smith, of Gibonsburg, Ohio had no idea the impact her recipe would have on generations to follow when she entered the 9th Annual Pillsbury Bake-off in 1957. While she didn't win the Grand Prize, the popularity of her cookies have far outreached the Accordion Treats brought by the 1957 Grand Prize Winner, Gerda Roderer. With adaptations made and published by numerous companies, it was the Hershey Company that acted on a hunch and printed Mrs. Smith's Peanut Blossom recipe on the back of packages of their Hershey Kisses. Slightly less sweet and with a bigger peanut butter punch, the Hershey version remains my personal favorite. Freda may not have been Bake-Off winner, but she will forever be thanked and appreciated by the millions who have enjoyed her sugary peanut butter/chocolate combo for over 55 years. 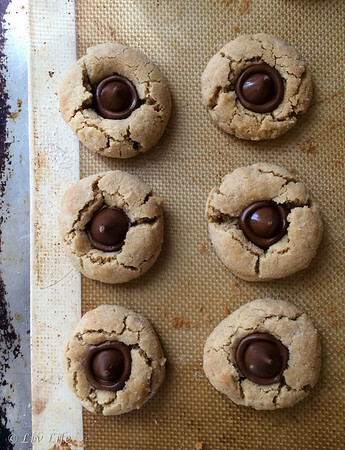 A true classic, no cookie repertoire is complete without this recipe. Thanks Freda. December, for me, usually represents a touch of indulgence. Somehow because it's the "holiday season" I give myself permission for that 3rd or 4th cookie on the plate, the extra cheese and crackers with my wine, and one more piece of Mom's Rocky Road Candy that I'm devouring even though it's safely hidden in the freezer. 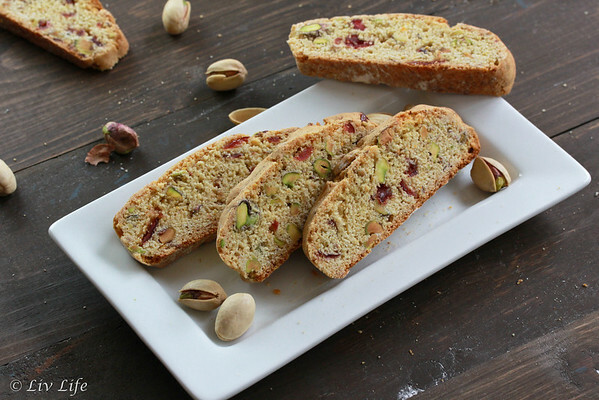 Knowing I really won't get back on the full healthy eating track until after the New Year, I try to add healthier ingredients where I can, and I'm feeling pretty darn good about these Rustic Pistachio Biscotti. 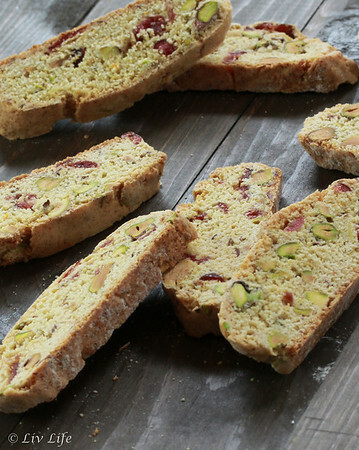 Biscotti, with their low fat content, tend to be a healthier choice when cookie indulging, but adding nuts, cranberries and whole wheat flours to the mix makes them an even better choice in my book. Receiving a care package from the lovely people at Hodgson Mill, their box arrived just in time for my baking duties for a fundraiser for Liv's high school dance team where these biscotti received the ultimate compliment. 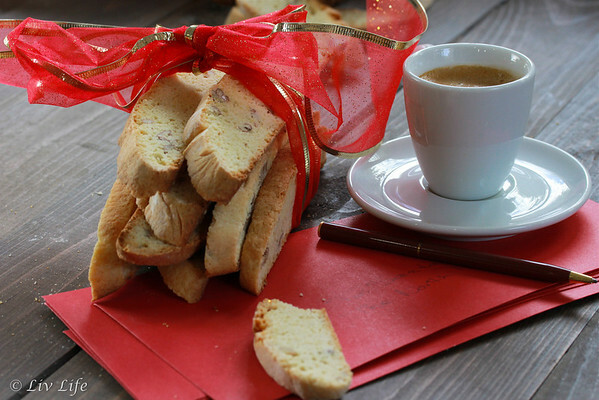 Set out as part of an array of treats for an afternoon fashion show and tea, one of the grandfathers in attendance proclaimed these biscotti "The best treat on the table!" 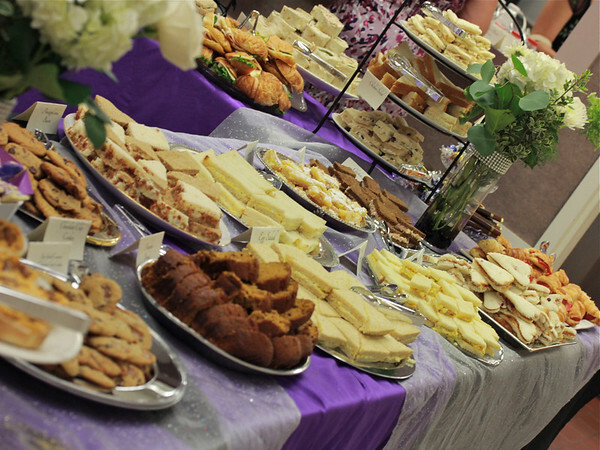 As my heart swelled with pride, I felt pleased knowing these treats brought a healthier cookie choice to the event. Choosing Hodgson Mill's White Whole Wheat Flour, I feel I can easily incorporate whole wheats into my baked goods while still keeping the treat, well... sweet. 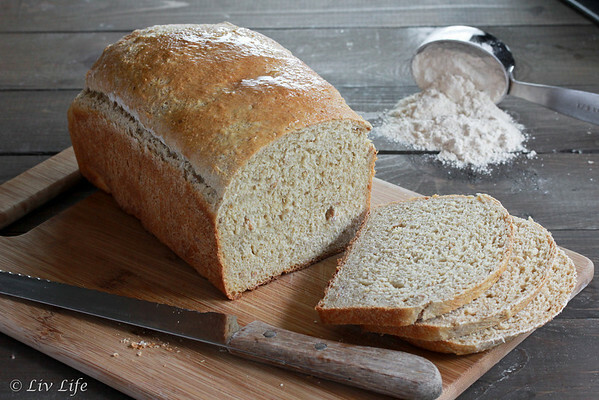 White whole wheat is named for it's lighter color, and while it's actually tan, the flour lends a lighter, whiter color than its red-colored cousin. Milder and sweeter than the red wheat, I use the white wheat frequently in cookies, pancakes, muffins and other baked good where I don't want a heavy wheat look and/or flavor. Hodgson Mill is a flour I often turn to as I know their flours have no added chemicals or preservatives and they aren't bleached. Stone ground at Hodgson Mill's mill, this whole wheat flour includes the entire healthy wheat kernel including the bran, germ and endosperm bringing fiber along with all the nutrients, protein and minerals the wheat plant grew. Want to try Hodgson Mill flours for yourself? First off Hodgson Mill is offering a $1.00 off coupon for a 5lb bag of flour or cornmeal, but better yet, they have provied us the opportunity to run a giveaway in celebration of their 25 Days of Grain Holiday for a prize pack filled with Hodgson Mill goodies (Gluten Free option available - Prize valued at $25). Winner will be selected by PromoSimple within 48 hours of the sweepstakes closing and contacted by email. Winners have 24 hours to respond to their notification email to claim their prize. If they do not respond, another winner will be chosen. All prizes will be awarded. I can't tell you how envious I am of the lucky winner here... I'd love to see a copy of that cookbook! For additional info and ways to win Hodgson Mills products be sure to check out their "25 Days of GRAIN Holiday” Sweepstakes! Full holiday mode has filled our life for the last few weeks, and as such, I've been living the life of indulgence. But with schedules bouncing us from even to event, I'm embarrassed to admit I've occasionally considered a whole grain peanut butter cookie to be lunch (protein and whole grains... right??). Needless to say, my menu planning has been a bit sketchy. 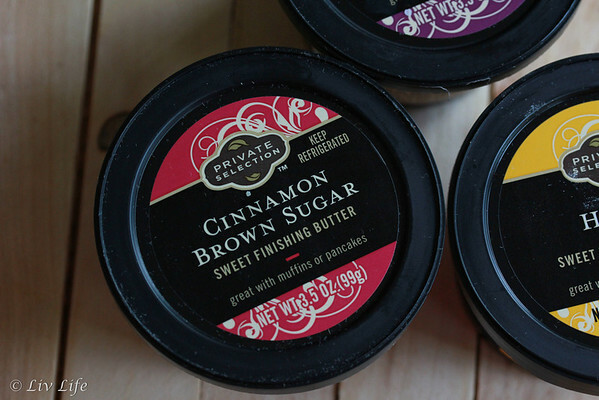 However... thanks to an offer from the fabulous people at Kroger, we've been the lucky recipient of their new line of Private Selection Finishing Butters. And thanks to this offer, my meal planning suddenly took a turn for the better. Receiving their entire line on a Monday, our busiest day of the week with Liv's schedule putting her through a 14 hour day of school and dance rehearsals, I needed to have dinner on the table perfectly timed for her 1 hour break. 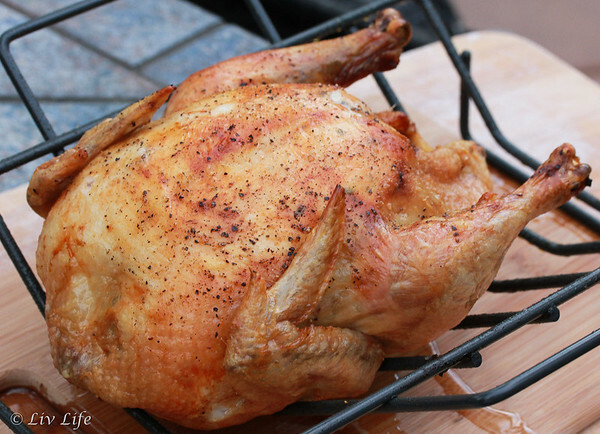 With chicken being a frequent request, I had a beautiful bird ready to roast, but I had forgotten to make the rub. Enter Kroger's Lemon, Garlic and Herb Butter! Thanksgiving week brought a little extra time along with homemade dinner rolls, and a brush of the Roasted Garlic and Herb Butter lent a nice touch to the top of our freshly baked rolls, again, making me look good. Leisurely mornings with French Toast? A dollop of the Cinnamon and Brown Sugar Butter gave breakfast a special touch, and once again... cooking kudos for me. But my favorite of the week had to be this Homemade Whole Grain Bread topped with Premium Selection Honey Butter. I've always had a weak spot for a sweet honey butters, but I have to admit I don't always take the time to make them. With Kroger's Honey Butter sitting already prepared in the fridge, a simple brush of the melted butter proved to be the perfect finish. 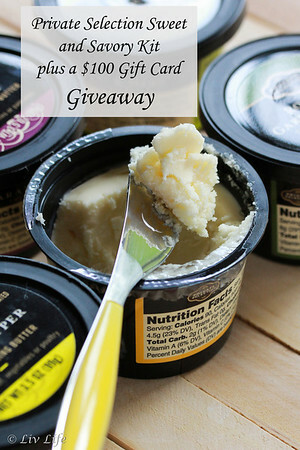 I can't thank Kroger enough for giving us the opportunity to try the butters, but even better... Kroger providing us a giveaway that includes a Private Selection Kit filled with a sweet and savory inspired selection of Private Selection Items along with a $100 Kroger (can also be used at Ralph's) Gift Card to one of our readers! Winner will be selected by PromoSimple within 48 hours of the sweepstakes closing and contacted by email. Winners have 24 hours to respond to their notification email to claim their prize. If they do not respond, another winner will be chosen by PromoSimple. All prizes will be awarded. Prize Description: The giveaway includes a Private Selection Kit filled with a sweet and savory inspired selection of Private Selection items and a $100 Kroger family of stores gift card. Many thanks to Kroger for making me look good these last few weeks even though my schedule hasn't really allowed for special planning. We appreciate the opportunity to try the finishing butters and also to share them. But, how about that bread recipe?? Deemed a new favorite in the Liv Life household, we've had 3 loaves in the last week alone and I can't see our love stopping any time soon. 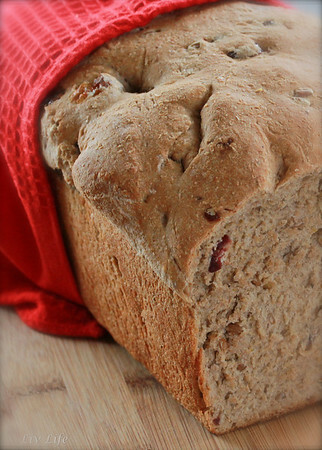 Filled with whole grains, this bread provides soft, tender slices for sandwiches and also toasts like a dream. Enjoy! Receiving the motivation I needed a few weeks back, I've kicked myself into the holiday spirit. According to Liv, there are moms out there (and apparently I wasn't one of them..) who allegedly make the holidays super fun with their sheer joy in everything holiday. Well... starting with Halloween I've been working on my attitude. We had Halloween decorations and desserts to share, and then moved smoothly into Thanksgiving with family and friends and a home filled with fabulous food cheer. Transitioning to the somewhat shortened Christmas season, I'm hereby making the most of these few short weeks with the house sporting its holiday finest, spirited baking adventures in the kitchen and gift wrapping already in progress. I have to admit that the gift planning part is one of my favorite activities of the holiday season, and finding that perfect gift for those I'm thankful to have in my life truly brings joy to my heart. 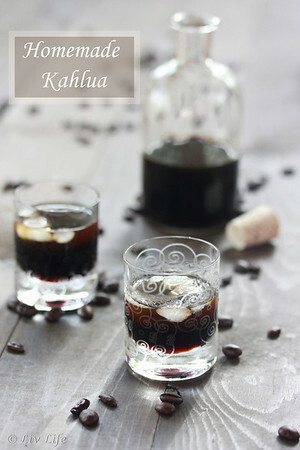 And now, I have these fabulous Kahlua Brownie Kisses featuring a splash of this year's fresh batch of Homemade Kahlua. Rich, chocolaty and somewhat irresistible, these little kisses are the perfect treat for a holiday get together or a last minute hostess gift. See below for the recipe. 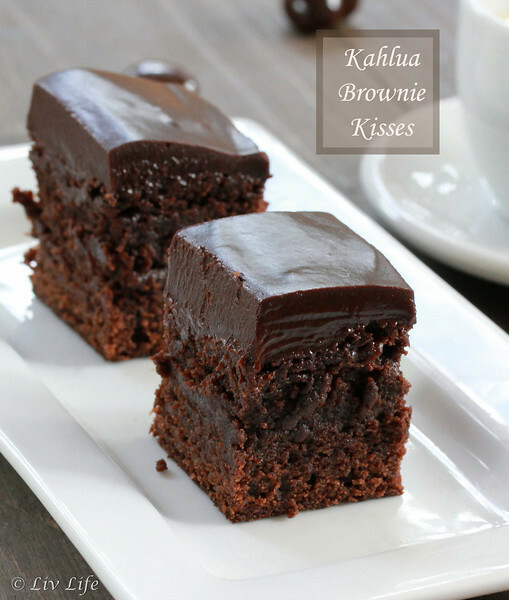 A wonderful way to share a taste of holiday cheer, these ultra luscious and Kahlua laced ganache brings a lovely topping to these rich, fudgy brownies. 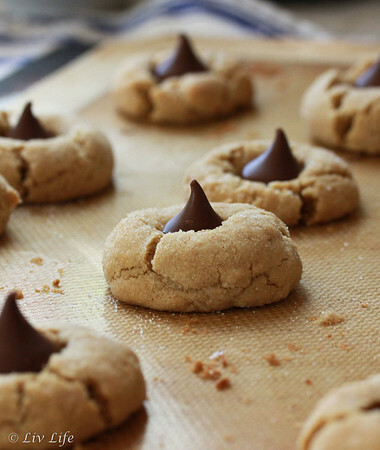 Easy to make and a definitely a chocolate lover's dream, these kisses make a fabulous addition to any holiday platter and will bring a smile to the face of someone special.